The eggs come six to a package, all milk chocolate, with three different fillings: Bordeaux, Vanilla Chip, and Chocolate Butter. They’re fairly small, from about the tip of your index finger to the middle joint. Each egg has a cute little flower on top, which the company describes as a “hand-applied decoration.” The white flowers mark the Bordeaux eggs: brown sugar buttercreams that are smooth and rich, with just a hint of caramel. The purple flowers mark the Vanilla Chip eggs, and biting into one is like sampling a mouthful of chocolate-covered batter from your favorite chocolate chip cookie recipe. And the yellow flowers mark the Chocolate Butter eggs, which are extremely fudgy and sweet, like frosting, only more dense. My favorite is the Vanilla Chip, which, sadly, can be hard to come by except in an Easter mix. The box costs $5.75, so about a dollar per egg. 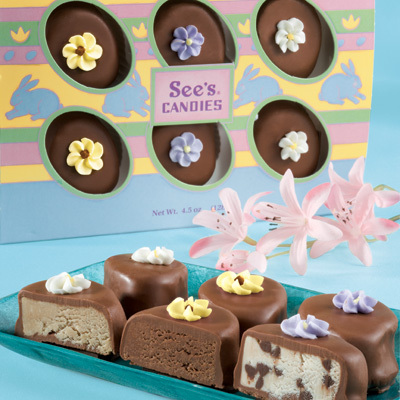 See’s Decorated Assorted Eggs are a fantastic indulgence, no question about it, but they’re incredibly sweet (especially the Chocolate Butter eggs!) and you’d really only want to eat one per serving. Any more than that, and your eyelids might start twitching from the sugar rush. Even though I’m normally a milk chocolate devotee, I’d be curious to taste the effect a dark chocolate coating might have on the level of sweetness for this assortment.